Yellow expresses will start to go Austria for the first time. 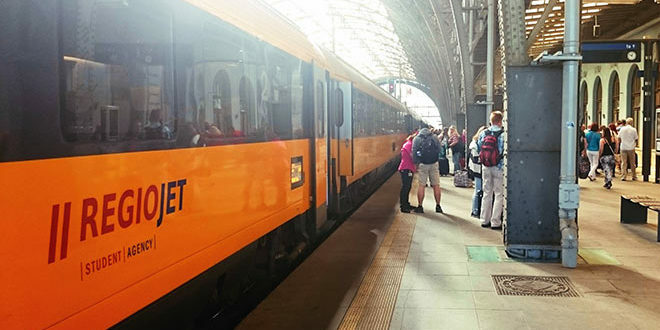 Four pairs of trains will daily connect Prague and Brno with Vienna, where the trains, apart from the main station, will stop at Simmering too. Passagers may look forward to attractive service on board, which is common on other RegioJet lines – including Illy coffee and other bevereges for free. The price is very affordable. Standard class tickets from Prague to Vienna are at disposal from 370 Kč /15 € and from Brno to Vienna only from 170 Kč / 7 €. The price is every day the same at every time. New is also the higher number of RegioJet trains between Prague and Brno. During rush hours even one train every hour. Seven trains will continue to Břeclav and then to Vienna or to Bratislava. Besides from the news about Prague, Brno, Vienna and Bratislava, RegioJet trains will also go to Opava. The train will start in Opava very early at 4.15 am, and will return to Opava at 7.20 pm.